Here at MO we like scooters, especially big ones. Laugh if you want, but when it comes to practical, versatile, comfortable, and fun two-wheeled transportation, scooters often get overlooked. Well, we’re here to give them their fair share. What other motorcycle will take you to the grocery store, have room for the box of cereal, gallon of milk and six-pack of beer you just bought, then welcome the chance to take the twisty road back home – all while having your left hand free to sip a latte? Here, we’ve gathered the biggest heavy hitters in scooterdom currently available in the United States capable of doing just that. 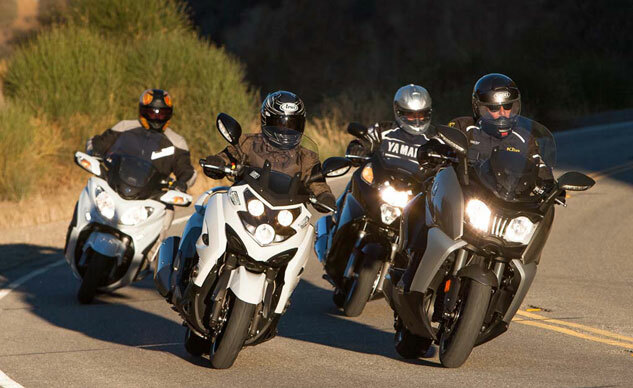 They are: the BMW C650GT, Honda Silver Wing, Kymco MyRoad 700i and Suzuki Burgman 650 ABS. The task, then, is to see where these Uber Scooters shine and where each falls short. 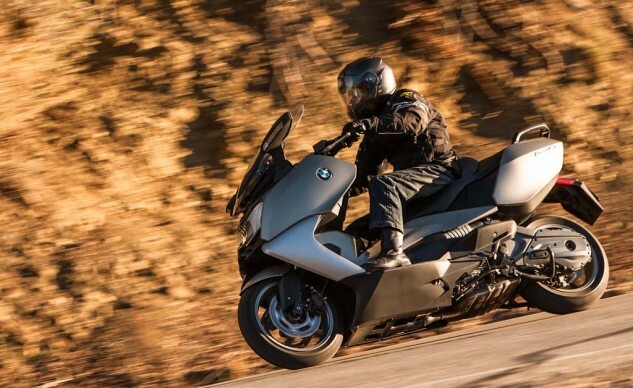 In most of the performance categories we tested, the BMW C650GT dispatched the competition, but that’s not all it takes to be an uber scooter. Starting in the engine department, these four parallel-Twins are remarkably evenly matched, and each can easily haul to 80 mph (or more) quicker than many cars on the road. The Kymco and its 699.5cc engine might be the biggest surprise. 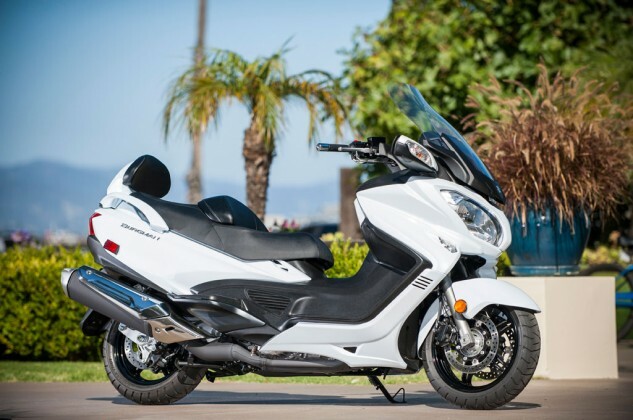 Kymco claims 59 hp and 46 ft.-lb. of torque, which is one horse and three ft.-lb. less than the 647cc BMW. We thought it would flex its muscle in dominating fashion. Instead, FNG Evans Brasfield felt it was sluggish off the line, while Head Cheese Kevin Duke felt it to be excessively vibey. That said, both Kevin and minivan editor Tom Roderick praised the torque and passing power, with Duke saying, “it feels almost like a diesel, with buckets of low-end torque.” We’re impressed at Kymco’s effort at a big-bore engine, but all of us wished for more refinement – a theme that would be carried throughout this test. 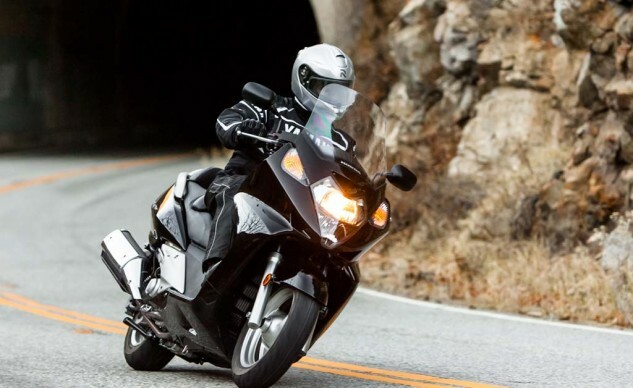 The Kymco MyRoad’s twisty tarmac performance was hampered by a deficiency of ground clearance. The chassis feels capable of much more. At the other end of the spectrum, Honda’s smallest-in-class 582cc mill tried its best to punch above its weight. With a claimed 49.6 hp and 39.8 ft.-lbs., “acceleration potential is likely quick enough for the majority of riders interested in such a machine,” says Duke, “but it’s outgunned in this relatively hi-po group.” Still, it emits a pleasing exhaust growl that could fool its rider into thinking they are going faster than they really are. Ultimately, it’s likely that if you’re looking at the Silver Wing, zero-to-60 and quarter-mile times aren’t a priority. The Silver Wing (seen in its natural environment) performed well at all of the challenges we threw at it despite having the lowest displacement of our foursome. The 647cc parallel-Twin in the C650GT can also be found in one of the most advanced cars on the road, BMW’s new i3 automobile. Designed for pure electric use, with a 22-kWh battery providing as much as 125 miles of range, the i3 can be equipped with the C650’s engine to extend range beyond battery-storage limitations. In this application, the trunk-mounted engine is rated at 33 hp and is used solely as a generator to inject juice into the batteries. The car’s AC electric motor boasts 170 hp and 184 ft-lb, which should be enough to propel the carbon-fiber-infused chassis to 60 mph in about 7 seconds. Adding the C650’s engine to an i3 will add $3850 to the car’s $42,275 price tag. If you ask us, you should just buy the C650GT. 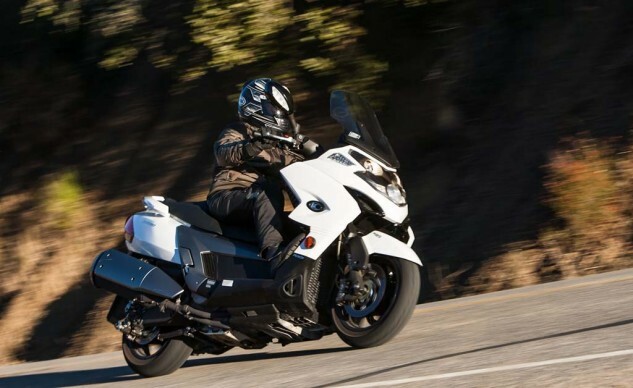 Splitting the difference between the Honda and Kymco are the Suzuki and BMW at 638cc and 647cc, respectively. As one would expect from BMW, the C650GT with its class leading 60 hp and 49 ft.-lb. (claimed) is incredibly refined, with its power delivered smoothly. Under normal circumstances the CVT transmission operates in harmony with the engine, but Duke noticed some slight hesitation from a stop. “The engine revs at launch but the clutch doesn’t fully bite, limiting its initial pull,” he says. “But then the CVT clutch bites harder and revs fall just below the snappy part of its powerband before finally delivering its full thrust.” But that was his only engine-related gripe. 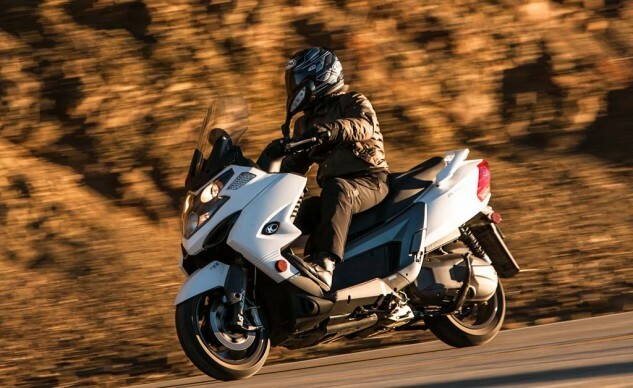 Suzuki’s Burgman handled surprisingly well, but it labored under the weight of its MSRP in the objective scoring. “Although I know it’s just a software trick, I liked the ‘thumb shifting’ feature,” says Evans. 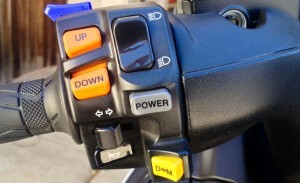 The Burgman’s many options are (from top to bottom): mirror fold switch (blue), thumb shifting (orange), power mode switch (gray), and drive/manual “shift” mode (yellow). “Being able to hold one gear through a series of corners gave me the feeling of more control of my entry speed through engine braking than the others.” While a neat feature, we wish the shift buttons were operated with the index finger and thumb. While you might not expect to see “sport-tourer” and “scooter” in the same sentence, these super scooters can pull it off. 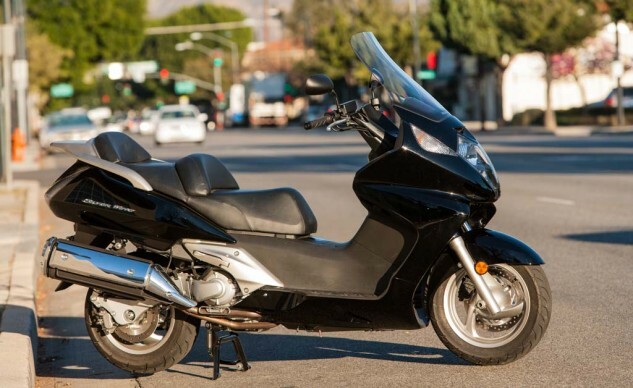 Considering their quasi sport-tourer status, these uber scoots all provide the comfortable semi step-through seating position that places the rider in a La-Z-Boy posture rather than the cowboy-like saddle-straddle of a conventional motorcycle. From here, however, the four contestants start to differentiate themselves from the others. 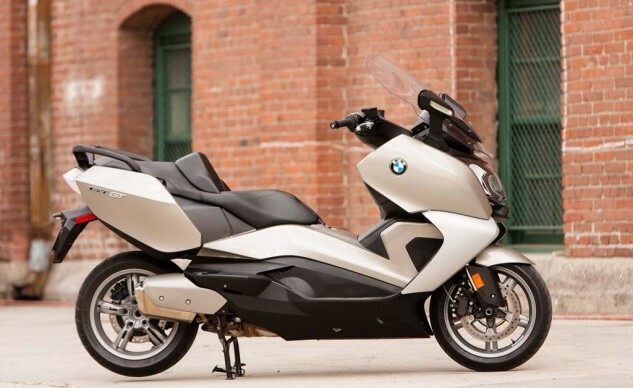 With the tallest seat height in this class at 31.7 inches (two inches taller than the Honda and Suzuki, one inch taller than the Kymco), the BMW C650GT is a challenge to mount for those with stubby legs. Even Brasfield noted some difficulty with the C650. “I have a 32-inch inseam, and I couldn’t flat foot on the BMW,” he says. Fellow tall guy, Roderick, echoes these sentiments noting, “The biggest knock against the C650 is its ridiculously tall seat height.” Conversely, the Suzuki’s legroom is only marginally less than the BMW, but its seat is two inches lower and features an adjustable backrest the others can’t claim. This allows riders of various sizes to feel comfortable and flat foot with greater ease. One of the Burgman’s nice touches is a backrest that can be adjusted a couple of inches to accommodate different rider sizes. Speaking of chilly, our C650 came equipped with optional heated grips and heated seat for both rider and passenger as part of the Highline Package, adding $605 to its $9990 base price. They were a godsend during our night ride in 28-degree weather, and even with the options, the BMW is still $400 cheaper than the base Suzuki. 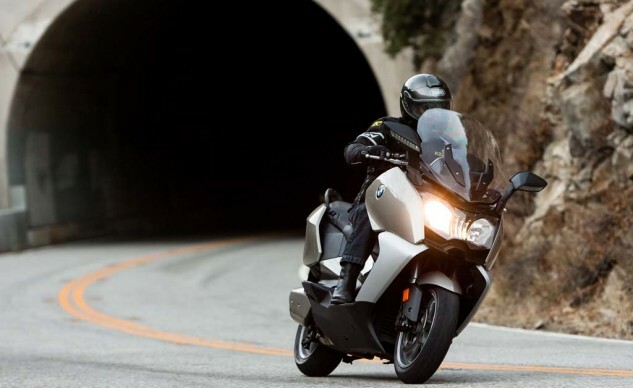 Heated grips ($249.95) and seat ($499.95, for rider only) are options on the Burgman, but they raise the price just shy of 12 grand ($11,748.90), $1,153.90 more than the Beemer. 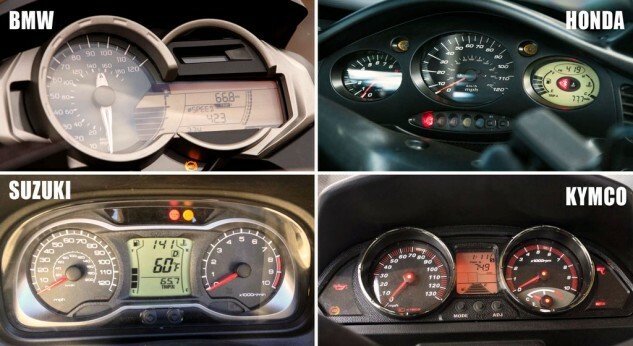 All four instrument clusters feature tachometers (a small LCD bar graph on the BMW), though it only really matters on the Burgman. Things get worse for the MyRoad, as the taller testers complained of cramped riders quarters. There were also complaints of an inferior backrest, which, when combined with the limited leg room, meant the Kymco was “uncomfortable after only an hour ride,” Roderick says. The $9,270 Honda’s ergonomics are a mixed blessing, feeling cramped front to rear for taller riders. But, Tom notes, “For anyone petite of stature and concerned about managing these beasts at stop lights or during slow parking lot maneuvers, the Silver Wing offers the lightest curb weight (541 lbs) and one of the lowest seat heights.” And despite the Silver Wing’s fixed windscreen, we found it still provides decent wind protection. 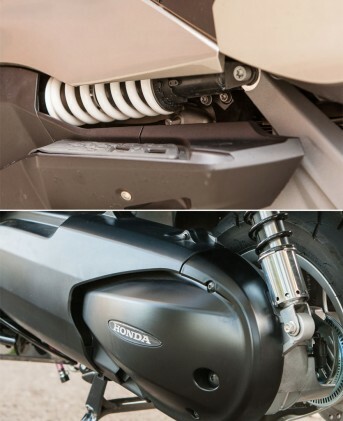 All of the shocks offered ramped preload adjustment – be they visible as on the BMW (top) or under a pretty chrome cover as on the Honda (bottom). As quasi sport-tourers, we also took each through winding roads to destinations unknown, all while carrying everything we’d need onboard. It’s here where each of the scoots impressed, but one really stood out above the rest. Trudging along in the city or on the freeway, the ride quality on all the scoots seemed adequate. All provide rear preload adjustment, and we liked the soft suspension settings on the Honda for general use. “It’s nice around town and on smooth roads,” Tom notes. Initial impressions of the Burgman leaned toward harshness on the highway, but lessened after some fidgeting. Meanwhile, the C650 impressed with its composure. “The BMW seems to have negotiated the fine line between taut handling and downright harshness,” Evans observes. Ride quality bordered on the limits of what we’d accept for general cruising, but considering our four tester’s penchant for twisty roads, this was an acceptable compromise for the sport riding that was to come. Granted, canyon carving isn’t what most would look to do with one of these four scoots, but your four testers aren’t like most people. Spurred by Tom’s initial impressions of the BMW C650GT and C600Sport at their launch and his desire to test the limits of lean angle, we ventured to the nearest curvy roads to check out their sporty abilities. What we found was truly surprising – all four are sportier than you might think. The Burgman can work through corners surprisingly quickly, but as the sparks reveal, the exhaust brings an early end to the party in right-handers. On winding pavement, the BMW had the most ground clearance (and consequently the highest seat) plus the most full-sized motorcycle feel. But when it comes to twisty road performance, there’s just no denying the BMW is the king of the crop. Graced with 15-inch wheels at both ends wrapped in Metzeler Feel Free tires, Kevin says, “Without question, the Beemer is the bike to be on if you enjoy sport riding.” Brasfield notes, “I preferred the BMW’s steering because if felt more like a full-sized bike.” The C650GT’s suspension welcomes canyon carving, and the chassis is equally well suited to the task. 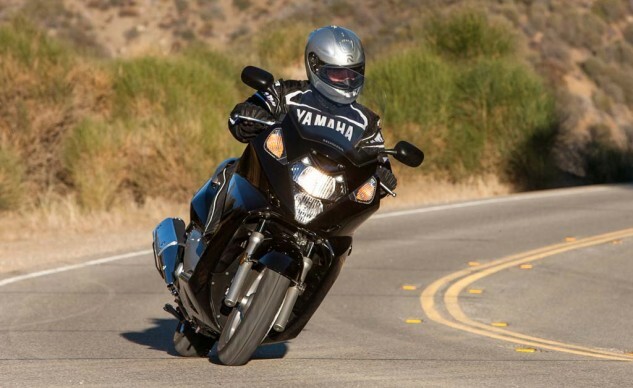 The Metzeler tires inspire loads of confidence, and you’ll be going at a serious clip before dragging hard parts. Despite tying for last in capacity, the Burgman was able to swallow two helmets. Taking these scoots out of their elements and into the canyons was a major highlight to this test. Focusing back on reality and the practical aspects of each, we turn to storage capacity. Here, the BMW leads the way with 60 liters of underseat space. The Honda is next at 55 liters, followed by the Kymco and Suzuki, each with 50 liters. Each could swallow at least one full-face helmet, with the BMW, Suzuki, and Kymco able to eat two medium full-face lids. Surprisingly, despite having the second-most storage space, the Silver Wing’s underseat area is shaped in a way that prohibits it from accepting two full-face lids. While able to hold two helmets, the BMW seemingly had room for the kitchen sink, too. The Kymco holds two lids and has a light plus a power port. All of the scoots feature small fairing compartments for small items like keys, phones, or wallets. The Kymco loses points for featuring only one fairing compartment, while the others have at least two. 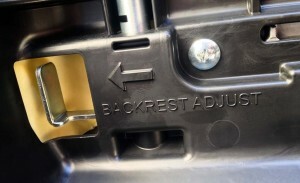 Our particular Silver Wing had a single lockable compartment with a dummy opening which appears to be sized right for a DC power outlet,but our tester didn’t come equipped with the accessory and neither is one listed on Honda’s website. 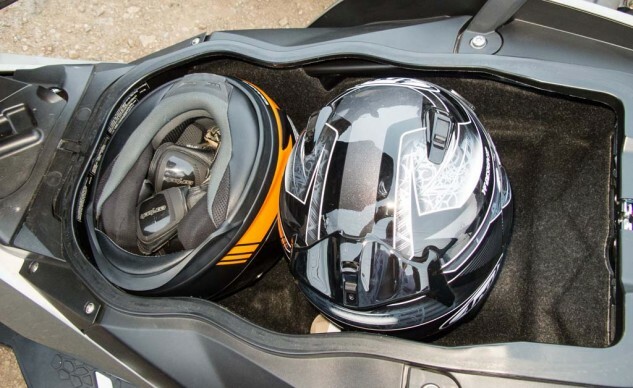 Even though it ranked second in capacity, the Honda’s underseat storage could not hold two helmets. It does, however, have a light. The rest of the bunch come with outlets, though the Kymco’s is located under the seat. 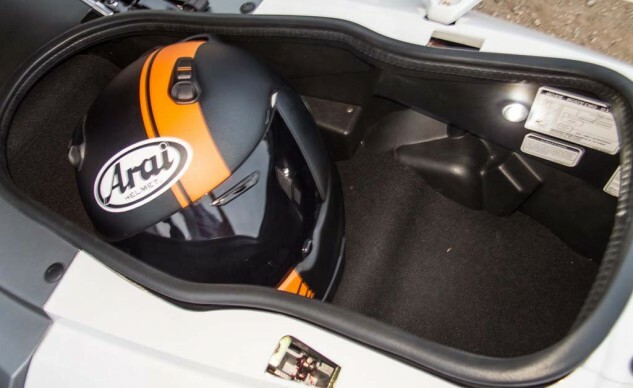 Its location in the BMW and Suzuki, deep inside one of the fairing compartments (the Burgman’s is lockable), allows access without the need to dismount. 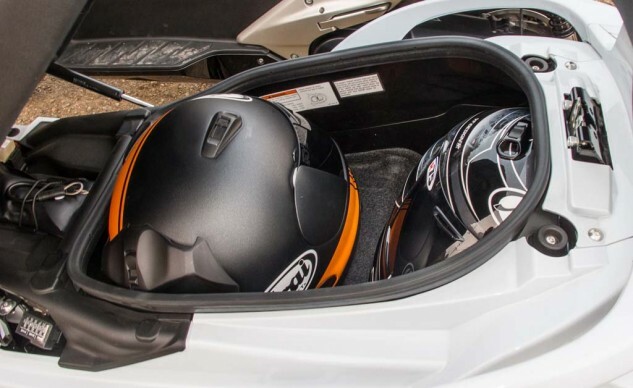 Overall, however, we scored the BMW’s underseat space the best, its nearly 60-liter capacity (59.5 liters) more than enough to carry whatever we needed for a long ride, though it does get a knock for not having a lockable fairing compartment. The Burgman was a close second, followed by the awkwardly shaped and/or less cavernous compartments for the MyRoad 700i and Silver Wing. The MyRoad and the Silver Wing represent the breadth of braking technology on the super scoots: The Kymco (left) features radial mount calipers on dual discs using braided-steel lines, while the Honda (right) gets by with a single disc plus linked brakes. Other general observations from the road: All four feature ABS, with the Honda’s a linked system. The Honda is also the only one void of a second front disc and adjustable levers. Speaking of which, the closest position on the Kymco’s levers was still a stretch for our fingers, though the MyRoad gets points for having radial brakes that work well. Rear ABS activates sooner than we’d like on all the scoots, and all four will halt with a generous squeeze, but the biggest difference is the “lack in feedback we’ve grown to appreciate on modern sportbikes,” says Duke. 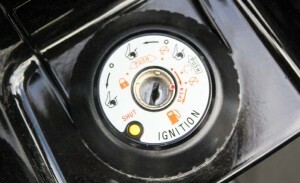 An ignition lock shouldn’t require an owner’s manual to operate. Can you tell that there are two ways to open the underseat storage? Multiple functions are great, but only if they’re easy to access. Three of the scoots allow fuel tank and underseat storage areas to be opened via a series of turns with the ignition, though the Kymco’s system seems overly complicated to navigate. The Honda was the only one requiring the key to be removed from the ignition for refueling and underseat access. Mirror placement was another oddity for these scoots. Both the Kymco and BMW units are buzzy and placed at an odd angle, making rearward visibility limited. 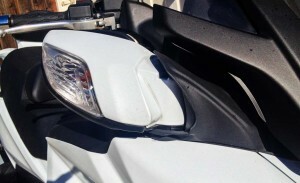 Regarding the Kymco, Evans says, “The mirrors are almost unusable on the freeway.” Honda’s mirrors appear to be from a 1990’s parts bin, as they are simply plain stalks screwed in to the bars. But they work and provide decent rearward view. Aside from offering the best rear view of all the scooters, the Burgman’s mirror pods can also retract with the push of a button. Most impressive is the Burgman’s mirrors. Incorporated low into the bodywork, the view behind is better than the rest. Even neater is the ability to have the mirrors fold in at the push a button – handy when splitting lanes or parking in tight spaces. “Inarguably the best rear view mirrors of the bunch and they electronically retract too!” exclaims easily impressed editor Roderick. All four provide parking brakes to ensure the scoots don’t go rolling away when parked, but the C650GT cleverly activates each time the sidestand is lowered. “I absolutely love that the BMW’s parking brake is attached to the sidestand instead of being a separate function as it is on the other scooters,” says Roderick. Indeed, the rest employ a pull handle either below the fairing or beside the rider, with the Kymco requiring an extra strong tug to release. These big-bore scoots could have been incredibly boring interpretations of actual motorcycles, or they could have revealed an underappreciated sector of the market. In our minds, we think it’s the latter. Of course traditional motorcycles occupy a huge place in our hearts, but we can appreciate the capabilities of super scooters. 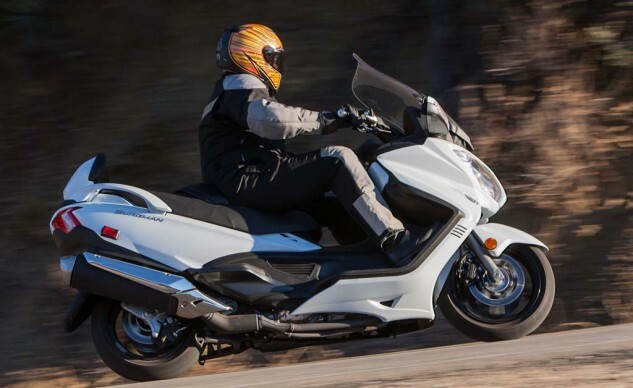 “All four provide twist-and-go ease of use, handy storage, and a performance envelope big enough to include light-duty sport-touring,” says Duke. As with all tests, there must be winners and losers. Using our trusty MO Scorcard we ranked the four contestants in a variety of areas. Subjective rankings like engines and handling are combined with objective scores like price and weight to come up with our final results. Here now are our rankings. Due to its low price and weight, the Silver Wing scored highest in the objective categories of our scorecard, and these are major factors to consider if simple, reliable transportation that’s easy to maneuver is all you’re looking for. However, the Honda scored last in our subjective scores. But the fact is all the other models here are new or significantly updated. Meanwhile, the Silver Wing is 12 years old. 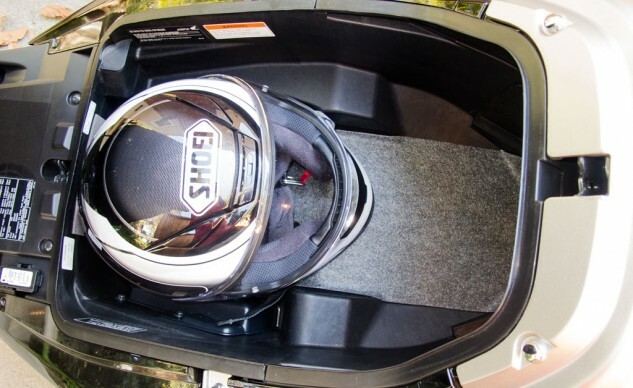 We liked the lil’ Wing’s around-town ride quality and its eagerness to change direction, but were disappointed with the flexy chassis and the fact we couldn’t fit two helmets under the seat despite having the second-largest claimed capacity. And we considered the lack of technology other than ABS a demerit in this relatively tech-rich field, but this may not apply to you depending on your wants and needs. Its handling/ground clearance disadvantage was a negative in the minds of our testers, but as our scores show, the Burg more than makes up for it in other areas. Ultimately, while we gearheads can appreciate the updates made to the transmission, it’s hard to explain the resulting high price tag to your average scooter buyer who couldn’t care less. At just one dollar shy of 11-large, before any accessories, that’s a rather large pill to swallow. Especially when matched with the BMW. So large, in fact, we have no choice but to put it in second place. 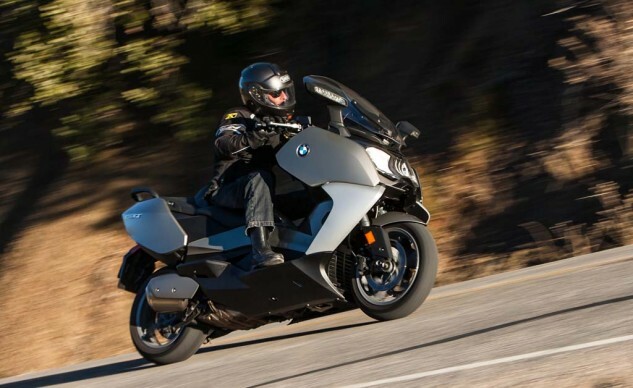 While the other three scooters definitely gave it a run for its money, the BMW C650GT proved to be top dog among the super scootering elite. Unlike the Suzuki, whose price ultimately overshadowed its performance, all four testers felt the C650GT managed the exact opposite. We expected a lot for its $10,595 as-tested price, and its sporty nature, healthy engine, cavernous storage, practicality, and comfy cockpit delivered. If you don’t generally ride in cold climes, then the $9990 base price (without the heated grips/seats) is even more of a steal in this company. 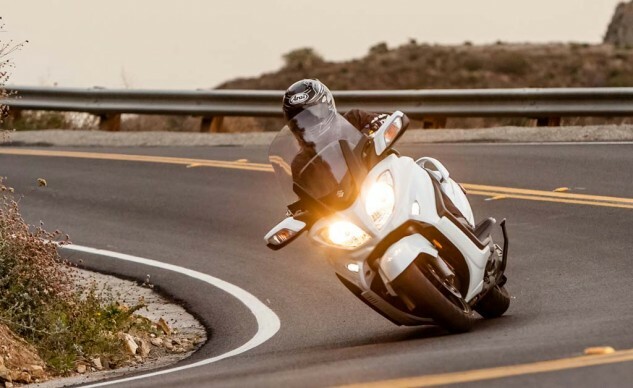 The C650GT scored highest in 10 of the 12 categories on the MO Scorecard, and during the course of our testing, all four riders pined for the BMW keys at each opportunity. Generally when that happens, the winner is a foregone conclusion. The BMW C650GT is no exception. It earns the title of Uber Scooter.